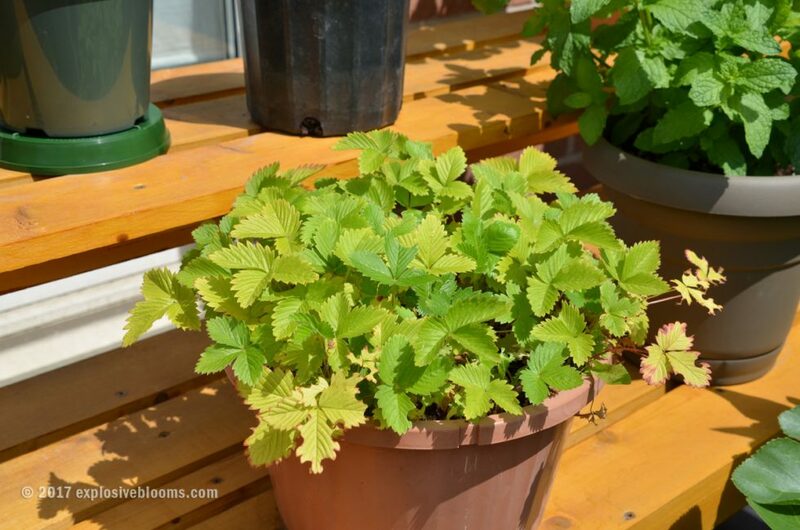 My no longer fruit producing Alpine strawberry plant remains on the potting table. The leaves have been yellowing, so I fertilized it a few weeks ago, and the leaf colour is slowly improving. What remained a big mystery for many weeks, maybe even over a month, has been the hole-punched leaves. I had posted a photo with the caption “chomp, chomp” when I first noticed it. Since this 4+ year old plant wasn’t doing anything, the discovery of something eating the leaves didn’t stress me out. I figured it had to be some huge caterpillar, or a beetle with large mandibles given the large, perfect circles. 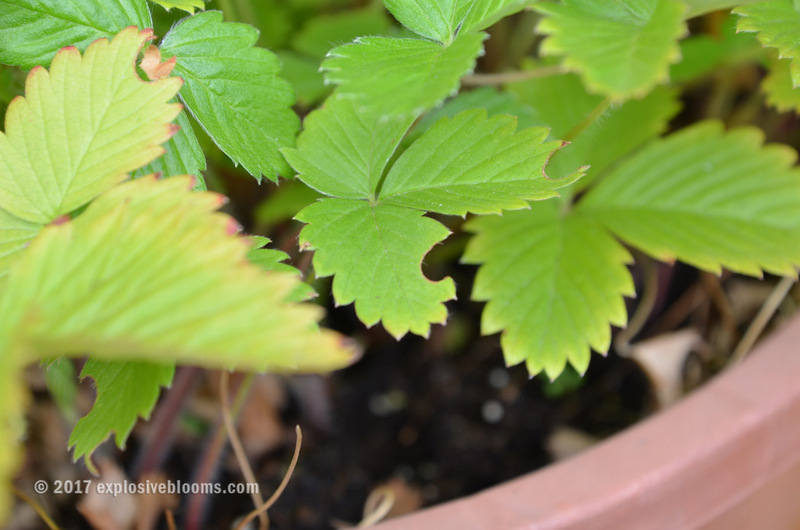 It was evident that whatever was munching on this strawberry plant’s leaves, only found this plant to be delicious. None of my other plants were showing signs of being snacked on. Another reason why I’ve continued to leave this plant in my garden. Today, the mystery has been solved. As I was checking on my zucchini, I noticed a black-and-white bee. 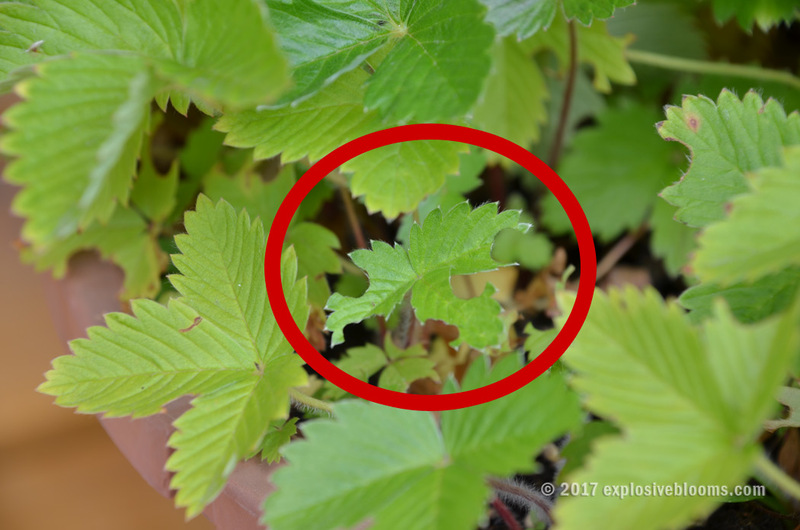 I’ve seen something similar before in my garden in previous years; however, they were smaller and were highly attracted to the cilantro flowers. Note that I have seen these little bees this year, again sucking pollen from the teeny-tiny cilantro flowers. Today’s black-and-white bee was bigger. I had my point-and-shoot camera in hand, but the damn thing wouldn’t focus the way I needed it to, so I just watched this bee land on the edge of a leaf. It didn’t stay long. I think my fidgeting with the camera and trying to get a photo of it scared it off. 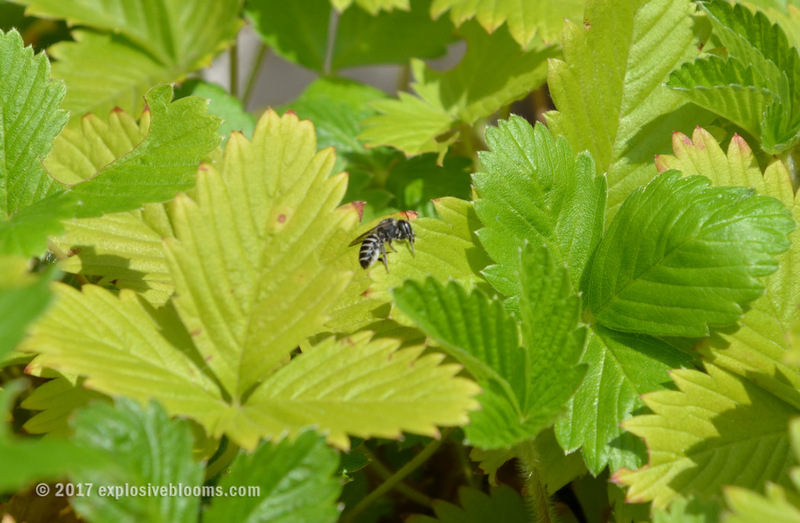 I ran into the house and quickly did a search and discovered that my guest is a Leafcutter Bee! To learn more about these pollinators in Ontario, visit this 2013 guide put out by Feed the Bees. 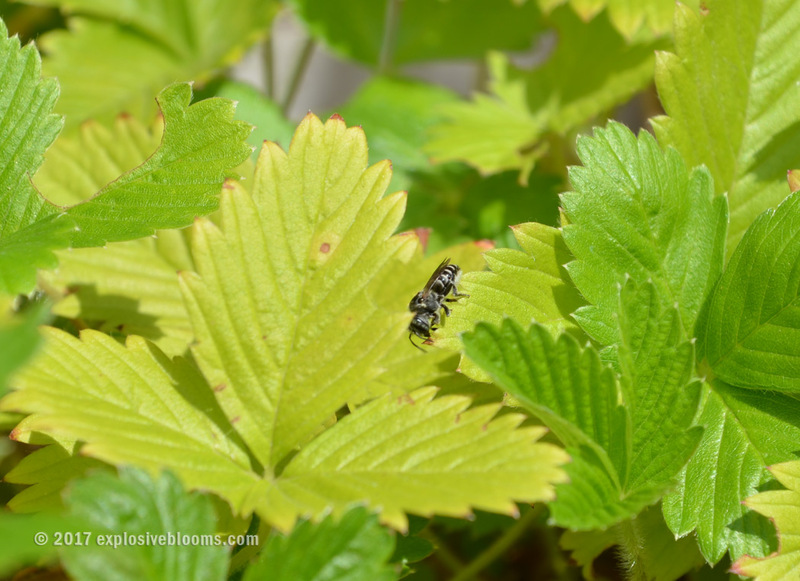 What I learned about the Leafcutter is that it is a solitary bee. The female bees cut circular patches out of leaves with their mandibles. They then carry the pieces back to the nest hole they chose and use the leaves to line the cavity and construct chambers to lay their eggs in. Leafcutter bees are not aggressive and have a mild sting that is used only when they are handled. For more interesting facts about Leafcutter Bees, see this fact sheet. I decided to go back out with my camera to see if the bee would return. It did not take long for her to return. From my photos, it looks as though the bee that visited my garden has a white abdomen, which might indicate that it is a Alfalfa Leaf Cutter Bee (Megachile rotundata) – This species of was introduced to the prairie provinces, from Europe in the 1960′s, to improve the pollination of our commercial produced Alfalfa crops and has spread across all areas of Southern Canada. It is now considered to be a “naturalized” species of North America. This Leaf Cutter Bee can be distinguished from it’s local indigenous relatives by its somewhat larger head to body proportions, short antennae and the white striping on it’s abdomen. I’m keeping my eyes peeled going forward, in hopes to catch this bee flying off with a piece of leaf tucked beneath it.